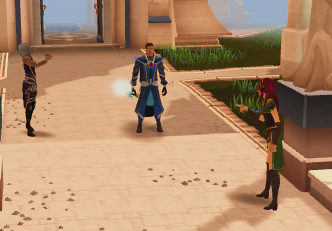 Stop an experienced adventurer and friend from ruining RuneScape! Find Xenia and Ariane outside the Wizards' Tower, south of Draynor Village. You can begin this quest by clicking on either Ariane or Xenia, who appear to be in a catfight near the entrance of the Wizards' Tower. Who said RuneScape doesn't prepare you for real life? You will witness the altercation, and have a choice of siding with Ariane, Xenia, or just breaking up the fight. What option you choose does not matter. Eventually Xenia will teleport away, leaving you with Ariane. She will tell you to meet you outside the old Wizards' Tower. Head east and speak to Ariane, who will be standing next to a golem. She will introduce him as Kinaesthetic Investigation Programmable Personality Lifeform Emulator, or Kipple for short. Ariane will explain that you must track down Xenia and that Kipple will be your companion when tracking her down. Speak to Kipple and tell him you would like to track Xenia down. You'll be asked to do a puzzle, which is poorly explained, so we'll try our best to explain it here. There are three main areas. 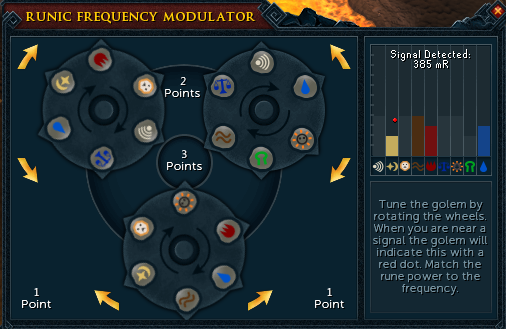 These are labelled "1 point" "2 point" and "3 point"
If your rune is 1 rotation away from pointing to that area, you get the number of points written MINUS ONE. 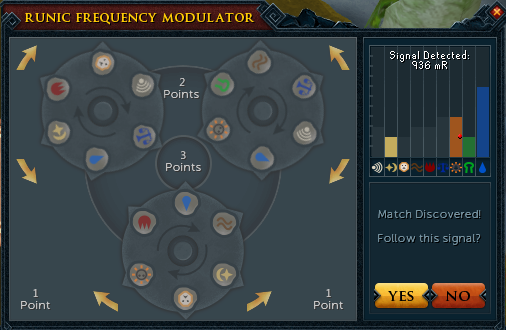 (If your rune is 1 turn away from dead centre, 3-1=2 points are awarded to you. If you spin the wheel by brute force you should get it eventually. You will be asked to do this puzzle eight times. There are three possible answers to the puzzle below, which can be asked/answered randomly. These answers will only work when you need to go to a new location. After completing this puzzle, you will need to retune Kipple with another puzzle (the solutions to which cannot be found in this guide). This solution will bring you to the Karamja Volcano. The solution will bring you to Entrana. You do not have to follow the order this guide goes in (for example, you could be asked to go to White Wolf Mountain first instead of the Karamja Volcano). 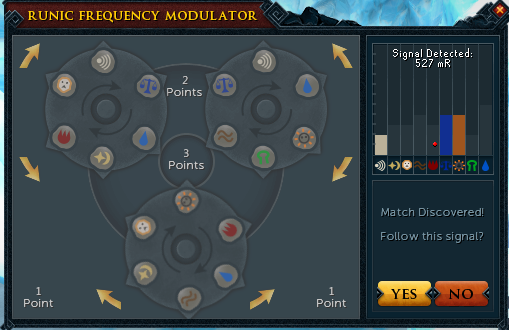 Once you find a match, go to the location the signal is purportedly in. 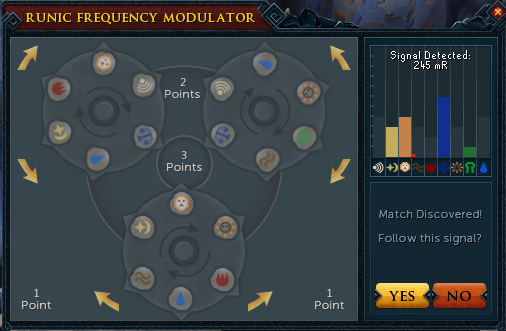 As stated earlier, these three locations can be done in any order. What order you do them in is random. You should also bring some combat equipment with you for the remainder of the quest as you will have to do some fighting. All monsters encountered in the quest are weak to air spells. After getting to every location, you will have to retune Kipple before being able to procede with the next part of the quest. While we have the solutions for finding the new areas (see above), we do not have the solutions for retuning because the solution to the puzzle never shows up properly on the screen. So you'll be on your own for those puzzles. When you approach the volcano, Kipple will appear and ask you to do another puzzle for retuning. Once you have done this, a portal will open. Enter it. You will be stopped by a mouthpiece, which Kipple will attempt to reason with. 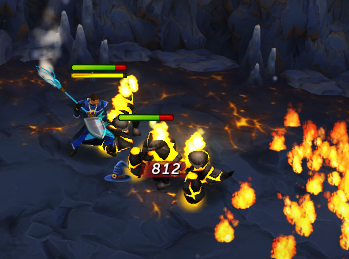 He will for the time being fail, sending a barrage of Tzhaar-like creatures after you. You will have to hold these off until Kipple has persuaded FulKra into speaking with you. 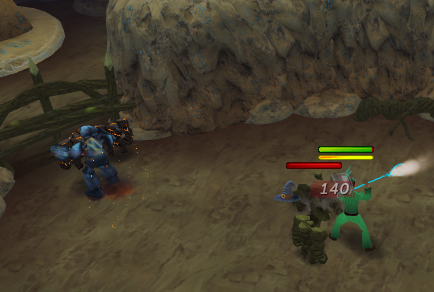 These creatures are level 44 and use melee at first, but then eventually use other attacks such as range. 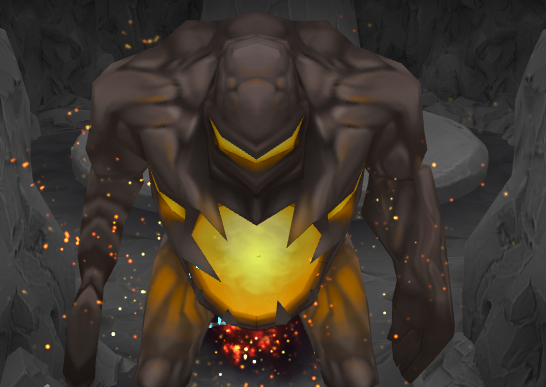 They will also spawn fire beneath you, which will hit you for a certain percentage of your lifepoints every second. These can be avoided by simply moving off of them. This fire will never disappear, so the you will have less room to fight as the fight continues. Eventually, Kipple will persuade FulKra into speaking with you. Speak to FulKra about Xenia and he will tell you that Xenia appeared to have stolen off a slice of his power for her own use. Now it is time to move to the next locale. Bank all of your armor and weapons (there is a deposit box next to the ship to Entrana in Port Sarim) and head to Entrana. You will be approached by Kipple, who will ask you to do another tracker puzzle. Once you have done this, enter the portal in the north of the island. Attempt to enter the Bik Door and Kipple will tell you that the mouthpiece has grown angry and alert you that you are about to be attacked. He will summon three weapons in your inventory. 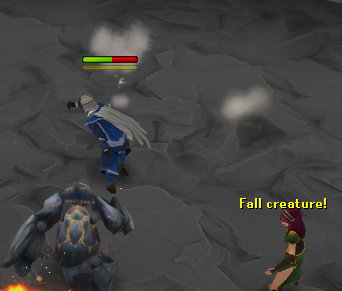 You should use the air battlestaff as the creatures are weak to air attacks. You will then be attacked. Kill the creatures and you will run into unstable attendants. Kipple will grab these and place them in front of the Bik door. After three attendants have been placed in front of the door, light the attendants and they will explode the door open, allowing you to enter. Speak with BikKra and ask it what Xenia was doing. When asked, choose the "mighty one" chat option (all of the other chat options will not work). Now, speak to Kipple again for finding the next location. If you attempt to re-enter Entrana with the weapons in your inventory they will disappear. Teleport to the Taverly Lodestone and run up the mountain. Retune Kipple and enter the nearby portal. You will be faced with a puzzle. The purpose of this puzzle here is to get an exact amount of charge into the gate. The exact amount should be specified in the chat. To do this, you will have to turn some pillars on and some pillars off (a few pillars consume electrical charge). You have to do this a total of five times, with each time getting more difficult. For later phases, it is suggested to get a number around the specified value and simply play around with the pillars until you have the specified charge. Speak to the WenKra about Xenia and then speak to Kipple for your next location. You need 20 free inventory spaces for this next part. Head to Sophanem (you may want to bring some waterskins to avoid the desert heat). Retune Kipple and head through the portal around two screens east of Sophanem. Once in the area, the JasKra will berate you for attempting to destroy it. You will need to convince it otherwise. Search any of the shelves for 20 observations. Review them and you will find they involve Xenia, Ariane, Kipple, and embarrassing observations of you. Combine the observations as seen in the table below. Use these observations on the JasKra, who will understand your innocence. Ask it about Xenia. 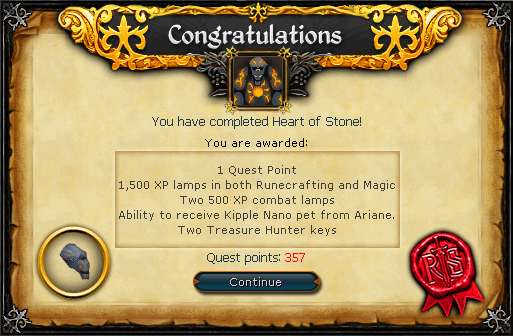 Now, speak to Kipple again and he will tell you that Xenia is in the Lumbridge Cemetery. 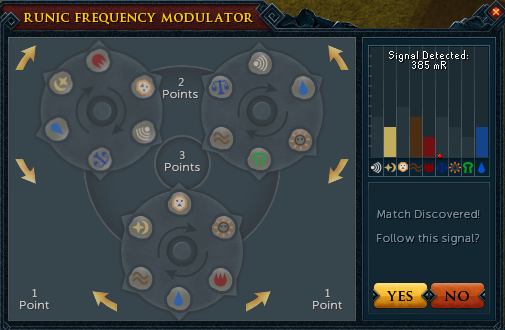 Lodestone teleport to Lumbridge and head south to the cemetery. Enter the portal and confront Xenia. She will tell you her reasoning, saying she is trying to prevent the end of the world. After a cutscene showing the world of a forsaken planet destroyed by the Elder Gods, Ariane will show up and demand Xenia to stop. Xenia will further explain that she spoke with a creature many years old during teleportation experiments and together devised a way to stop the Elder Gods. She says that the only way to prevent the destruction is by stopping the flow of Anima Mundi, which inconveniently would also stop magic. When Xenia is about to fulfill her goal, Ariane strikes her with a magical spell, throwing her into the abyss. She gets replaced with a level 56 Prehistoric Abyssal. Atttack the abyssal. The abyssal is fairly weak, but has a special which can hit you for a fair amount of your lifepoints. At first, it will be immune to your attacks. Over time, Kipple will find abyssal vines in the room, which you should destroy by clicking on them. After you have destroyed all of the abyssal vines, the creature will blast Ariane and Kipple. It will then turn your attention to you. The Abyssal now has a potentially devastating ultimate ability attack, which can hit you for around 25-35% of your lifepoints. To combat this, try using the "Natural Instinct" ability if possible, or adrenaline leeching prayers. Make sure to keep your hitpoints high and never let your guard down. Eventually the abyssal will be defeated. Speak to Ariane to finish the quest. The Kipple Nano pet is a miniature version of your fallen friend. To obtain, speak to Ariane near the entrance of the old Wizards' Tower.